The history of urban development is associated with the degradation of rivers - the deterioration of water quality, increased flooding, and the loss of ecological resources. The story of urban streams and rivers is as much a social history as it is a technological one. The control of nature and exploitation of natural resources was at the heart of the industrialisation process and of advances in the co-ordination and effective administration of water-and land-management schemes. Today, new approaches to the management of urban water are a response to advances in scientific knowledge and technology, and of a new concern for quality of life. Environmental improvement and ecological restoration demonstrate confidence in an area, which can enhance economic competitiveness. Along with improvements in air quality, building stock and transport networks, the restoration of stream and river corridors can make a major contribution to the success of urban regeneration schemes. 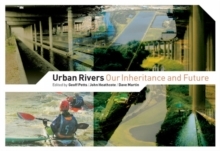 Urban Rivers provides an illustrated overview of the effects of urbanisation on the aquatic environment, potential solutions to the resulting problems, and new opportunities for the regeneration of urban streams and rivers, and of land along their corridors and of adjacent urban areas. The book is written to be accessible to a broad audience and should provide a stimulating and informative introduction to the subject for all those concerned with the urban river environment.